We’d love your help. Let us know what’s wrong with this preview of The Whitby Witches by Robin Jarvis. To ask other readers questions about The Whitby Witches, please sign up. I've written about The Whitby Witches before but never quite in the guise of a formal review. Upon the decision that I wanted to use this book in my PhD (and how, oh how could I not...), I knew it was time to fix that. And so: a review. But how to review this dark and powerful and wildly fantastic book, oh where to begin with such a book that is the first in a trilogy but not, somehow. The Whitby Witches is of Whitby and responsive to Whitby and in dialogue with the story of Whitby and all of th I've written about The Whitby Witches before but never quite in the guise of a formal review. Upon the decision that I wanted to use this book in my PhD (and how, oh how could I not...), I knew it was time to fix that. And so: a review. But how to review this dark and powerful and wildly fantastic book, oh where to begin with such a book that is the first in a trilogy but not, somehow. The Whitby Witches is of Whitby and responsive to Whitby and in dialogue with the story of Whitby and all of the stories of Whitby. It's a beginning, yes, to this story, but also a response to Dracula and to the Hand of Glory and the Barghest and to the sea and to the storied history of Whitby itself. So. A beginning. Jennet and Ben, orphans, are off to Whitby. They have been fostered by Alice Boston (Aunt Alice), a redoubtable woman of redoubtable talents. She is 92 years old, insists on climibg the 199 steps before breakfast every day and is holding a secret of her own. But then again, so is Ben. And so is Whitby. But the thing about secrets is that they insist on being discovered and so, eventually, awfully, things begin to occur in the Whitby. Events spiral. People die. Darkness rises. Aunt Alice, the children and their friends, must make a stand against the darkest of evils. This is such a book. I remember the first time I read it, growing up in the North Yorkshire Moors, and I was almost made breathless by this story. Jarvis' style is so honestly readable; he faces the darkness and he brings to it such glorious moments of people and heart and bravery, that this book deserves to be at the forefront of our consideration of British children's literature. I devour this book. Every time. For sometimes I think this series is forgotten and that is not right. It is a matter-of-fact story about magic and power and friendship and hope and being very, very brave. It is a story about people. And magic. And fear. It's very hard for me to be objective about Robin Jarvis - he's a childhood author that I think has infiltrated my very consciousness and I love his worlds dearly. But it was interesting to re-read a favourite with the jaded enthusiasm of an adult and find that, actually, this still stood up as a superb piece of children's fiction. Like Pullman, Jarvis is an author that anyone from ages 8 to 80 could read and adore. The Whitby trilogy isn't as JESUSCHRISTDARK as say, The Deptford Mice trilogy, b It's very hard for me to be objective about Robin Jarvis - he's a childhood author that I think has infiltrated my very consciousness and I love his worlds dearly. But it was interesting to re-read a favourite with the jaded enthusiasm of an adult and find that, actually, this still stood up as a superb piece of children's fiction. Like Pullman, Jarvis is an author that anyone from ages 8 to 80 could read and adore. The Whitby trilogy isn't as JESUSCHRISTDARK as say, The Deptford Mice trilogy, but it is just as compelling. And man I really, really need to visit Whitby. I’m not sure what age group this book is intended for, I’m guessing around 10-ish as this is a book I would have adored at that age. 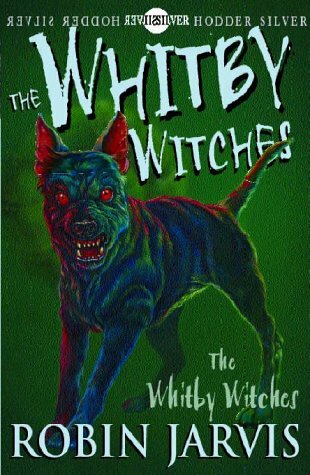 The descriptions of Whitby are perfect and who wouldn’t love a book filled with witches, aufwaders and barghest? I have to search out the other books by this author. I am so excited that Egmont classics are producing a reprint of one of my favourite series of books. Recently I read 'The Devil's Paintbox' and 'The Power of Dark' which are part of a quartet of new witch stories set in Whitby. While I loved them there's som Copy provided by NetGalley in exchange for an honest review. I am so excited that Egmont classics are producing a reprint of one of my favourite series of books. Recently I read 'The Devil's Paintbox' and 'The Power of Dark' which are part of a quartet of new witch stories set in Whitby. While I loved them there's something about the original trilogy as you first discovered it as a child. I became a lifelong Robin Jarvis fan after reading the Deptford Mouse books - he is one of the few authors where I will pretty much read anything he writes. Anyway this book when I first discovered it introduced me to a dark and bittersweet dark fantasy world where many traditional urban fantasy tropes are subtly flipped or subverted. It's always hard not to fall in love with Jarvis' characters - or to seriously hate and fear the truly rotten ones! The Whitby Witches tells the story of orphans Ben and his older sister, Jennet, who are having difficulties within the care system because Ben is different. He has the sight and struggles not to say what he sees to others. This has resulted in the pair being returned to the orphanage by more than one set of prospective parents, leaving the pair quite insecure, Ben isolated by his ability and Jennet with a sizeable chip on her shoulder and an unwillingness to trust. Finally a new home for them is found in Whitby - the orphanage is as keen to be rid of creepy Ben as anyone else - with the sprightly and eccentric nonogenerian Alice Boston. Miss Boston is the first person to understand that Ben is sighted and to accept the pair. However just as Jennet thinks life might have taken a turn for the better, strange things start to happen in Whitby. A huge black dog stalks the lonely lanes at night. A strangely charismatic widow opens an antique shop. And Aunt Alice's friends start to go missing only to turn up dead one by one. There's something foul in the state of Whitby and somehow the unlikely trio must get to the bottom of it. It took a while for the story to get going, but as it got further in I slowly got into it. Set in Whitby, a place with a lot of lore and legends. Ben and Jennet are orphans that have been taken in by the elderly and eccentric Miss Boston. Ben has had trouble fitting into other foster homes since their parents deaths because he has the gift of sight and can see the dead among other things. His sister Jennet does not share his gift so therefore doesn't know whether to believe he can see what he sa It took a while for the story to get going, but as it got further in I slowly got into it. Set in Whitby, a place with a lot of lore and legends. Ben and Jennet are orphans that have been taken in by the elderly and eccentric Miss Boston. Ben has had trouble fitting into other foster homes since their parents deaths because he has the gift of sight and can see the dead among other things. His sister Jennet does not share his gift so therefore doesn't know whether to believe he can see what he says he does, although she is fiercely protective of her younger brother. I picked this up when I was I Whitby as I love the town and I wanted to read more stuff that was set there. The Whitby Witches was just so fun! I loved the plot and the characters. I do think the ending was a bit rushed tho. Honestly I thought the third act of this book was completely garbage and left the whole read feeling utterly disappointing. The world and characters as they're set up make for a potentially interesting plot with a boy who can see ghosts and an adoptive aunt who could once do the same but now enjoys the company of other old ladies whom perform seances together, but alas this is abandoned in favour of a more convoluted story whose climax is woefully poor. The authors over reliance on character monol Honestly I thought the third act of this book was completely garbage and left the whole read feeling utterly disappointing. The authors over reliance on character monologuing to deliver exposition was the first sign that this stories conclusion was going to be handled poorly but good God the barrage of bait and switch scenes that take place in the last 2 chapters was like reading an essay that was simultaneously fearful of overstepping the word count whilst frantically attempting to cram as many tropes in as possible before ending. In all honesty I could never recommend anyone take the time to read this book unless you're looking for an example on how not to conclude a story. Edit: Reading other peoples reviews it seems that a lot of people read this book in their childhood or adolescence and at that time it meant something important to them so maybe that's the trick to enjoying this book? Ben and Jennet are travelling from the North East of England to Whitby, North Yorkshire to a new adoptive home. Since the death of their parents they have moved from foster home to foster home: Ben's ability to see dead people tends to put off foster families. On arrival at Whitby they meet their new adoptive mother- the eccentric elderly Alice Boston. The children settle in quickly, enjoying getting to know Miss Boston and explore Whitby, getting to know the local legends, including the story o Ben and Jennet are travelling from the North East of England to Whitby, North Yorkshire to a new adoptive home. Since the death of their parents they have moved from foster home to foster home: Ben's ability to see dead people tends to put off foster families. On arrival at Whitby they meet their new adoptive mother- the eccentric elderly Alice Boston. The children settle in quickly, enjoying getting to know Miss Boston and explore Whitby, getting to know the local legends, including the story of St Hilda, Dracula and the Barguest, a sort of ghost dog whose appearance foretells death. When a mysterious and sinister woman, Rowena Cooper, appears and insinuates herself with Miss Boston's friends, some very mysterious things start to happen. Ben meets a strange group of creatures that only he can see- the Aufwaders- who are dying out due to a curse. How their story, that of Rowena Cooper and a mysterious nun fit together makes for a great fantasy read. It would work brilliantly as a class novel, especially for a KS2 learning about coasts and shores as a Geography topic. It would also be a great guided or independent read for Y4+. My only quibble is that for me the ending felt a little unresolved, possibly as it is the first in a trilogy. This review has been hidden because it contains spoilers. To view it, click here. Such high hopes. First of all, Whitby is one of my most favorite places in the world. Quaint, haunted, gorgeous. I spent one of the best weekends of my life there. So when I saw this, admittedly Harry Potter-esque, book in a clearance sale all I had to see was "Whitby" and "Witches". DONE! But wow, disappointing. I finally stopped b/c I just didn't care. WAAAY too many subplots going on and not doing much to tie them up. (And I gave up close to the end.) Character development not great. There was a Such high hopes. But wow, disappointing. I finally stopped b/c I just didn't care. WAAAY too many subplots going on and not doing much to tie them up. (And I gave up close to the end.) Character development not great. There was a character map in the beginning, describing very interesting ladies, who were all KILLED OFF, halfway before the book was over. Why bother telling me all these things about them and ensuring I can tell them apart if you're just going to off them. I read this in second year at secondary school (about 13 year old year age). I'd recommend it to younger children. It will widen their imaginations, as it did to mine. Coming to this new edition of Robin Jarvis’s classic young adult novel for the first time as an adult I feel that I definitely missed out as a child by overlooking his work. This is a wonderful, dark, spooky tale set in the seaside town of Whitby (famed for its ties to Dracula so giving the setting a layer of superstition before the book has even started) with an archetypal struggle between good and evil. Two or I received a free copy of this book from Net Galley in exchange for an honest review. Two orphan siblings – Jennet and her younger brother Ben – have been moved from foster home to foster home since their parents’ death as their carers find Ben’s possession of ‘the sight’ too disturbing. Branded troublemakers the two are ejected from their previous home only to find themselves living with Miss Alice Boston, a surprisingly sprightly 92-year old with a unique perspective on the world and less than ordinary pastimes. But Whitby is under threat and Jennet, Ben and their new foster mother are drawn towards danger as they try to avoid becoming casualties of the supernatural forces wreaking havoc on the life expectancy of the locals. This is a wonderful book that is not afraid to place its wonderful characters in real peril - Jarvis is not daunted to bump someone off if the plot demands it. This makes the book that much more dramatic, scary and thrilling. As an adult I found it hugely compelling – if I had read this as an older child I imagine I would have found it deliciously chilling and engaging. This is rightly considered a classic of its genre. What a gem. This book is set in the wonderful English seaside town of Whitby, however a slightly alternative universe where there is a certain amount of magic that is not common knowledge to most people. I liked this setting, though my own experience of English seaside towns is less ‘oh how charming’ and more ‘oh I’m sure this was nice a long time ago but now it just looks a little crusty’. The level of fantasy I felt was pretty standard for a novel for young teens/older children as it isn’t overly complicated. I imagine, if one were going to pitch this novel at an older audience there would be more explanations of how magic works but it just wasn’t necessary in this title. As far as characters were concerned it was the classic older sister/younger brother orphans dynamic. I thought both children were suitably non-whiney and also both had a significant hand in the plot, rather than one of them dominating which was a pleasant change from a lot of sibling duos. It was the old ladies who really captured my heart in this book. Aunt Alice is a likeable and also powerful character that you just know you would have a good time if you got to have tea and cake with her. Our villain was a masterpiece of a children’s book villain. She caught my attention and she was just a horrible person. There’s a nice simplicity to that, something you don’t see often in literature aimed at the slightly older. The plot is a good one. We meet mythical creatures, there’s a quest, a time limited pursuit for a magical artefact and everyone learns something by the end of the book. I really enjoyed this foray into children’s literature. In many ways it was a simpler time back in 1991 and you don’t feel as though this book is following any trends or anything like that. It was refreshing and fun and while the book isn’t a barrel of sunshine and rainbows I think it would make a really good story for younger avid readers. "Adolescent histrionics," Mrs. Joyster remarked dryly ... "Girls like that are only seeking attention." "Well, I'll make sure she receives some then," Aunt Alice barked back at her. But I did have a few issues. I found the more-or-less omniscient story-telling a bit confusing at times, with a fair amount of head-hopping - by the end of the book, I wasn't sure who the main protagonist(s) were supposed to be - Aunt Alice, or the kids? And I found the 'baddy' a bit one-dimensional and her motives a bit confusing. Also, I thought it was a shame Ben never got his moment, though I assume that's probably resolved in later books (that I haven't read yet). I found the final chapter/climax a bit over-long and OTT as well. I have no self control (and I really love witches, man), so when I was in Whitby, 10 minutes away from catching a train, and saw this in a bookshop - I had to have it. Robin Jarvis is not my childhood author - that title belongs to Astrid Lindgren, so the feeling that I had when I read it might be different from most people. But - it's solid. I especially appreciated the older women being witches, and completely going under everyone's radar because they're grandmas. (On a side note: what if the H I have no self control (and I really love witches, man), so when I was in Whitby, 10 minutes away from catching a train, and saw this in a bookshop - I had to have it. Robin Jarvis is not my childhood author - that title belongs to Astrid Lindgren, so the feeling that I had when I read it might be different from most people. But - it's solid. I especially appreciated the older women being witches, and completely going under everyone's radar because they're grandmas. (On a side note: what if the Hatton Garden diamond heist was done by women? Would it have been different?) Anyway, that lets them go under the radar. It's amazing. A rereading of a childhood favourite. I loved Jarvis' books as a child, and this one has stood up well. It's much darker than I remember, strangely, and over the intervening 20+ years I'd forgotten most of the story, so it was as gripping as ever. I can see myself working my way through the rest in the near future, and maybe reading some of the ones I'd grown too old to read first time round. A great piece of magical fantasy. Robin Jarvis’s horror novel for children aged 9+ (the first in a trilogy) is a creepy, sinister read but the pacing is uneven and the antagonist two-dimensional, which is a shame as there are some stunning scenes while the developing relationship between Jennet, Ben and Alice held my interest but not enough for me to automatically check out the sequel, although I would read Jarvis’s other work. I was really enjoying this book, the characters were interesting and the plot was moving along and a good pace that kept me reading. This would have got 4 stars but for the weird fast paced (completely different to the rest of the book) rushed feeling that the end gave me. While I liked the idea of the time travel scene I thought that the execution of it just felt wrong for the book. What on earth did I just read? That is a hell of a body count for a children's book. And WTF was going on in the final chapter? Why did a person write this, and then other people publish it? A fantastic read for middle grade readers. Full of mystery magic and witches, set in the fishing town of Whitby; however given that Count Dracula was said to have landed here, you can understand why people think in terms of the macabre when talking about it. Didn't really know what to expect of this book, I was on holiday in Whitby, where this book is set, so bought it on an impulse. I think it was aimed more for children than adults but nevertheless it was an okay book. DNF’d about a quarter of the way in. I just don’t think it was for me. Read this book countless times as a kid, and loved it. Still an enjoyable read as an adult. Wonderful mix of reality and fantasy. Meant for young teenagers, but worth a revisit as an adult. A feel good children's classic. Adventure.. everything you can want in a book! I love this book which will appeal to children and adults alike. It's a tale set in Whitby and it incorporates many of the traditional legends of the town including the Barguest (the supernatural fierce black dog, which is a Yorkshire legend), the white lady alleged to haunt the Abbey, myths surrounding St Hilda, and some of the Dracula myths too (the witch crawling down the cliff is very redolent of this); but what I loved most about this book is the way it captures the quintessential essence o I love this book which will appeal to children and adults alike. It's a tale set in Whitby and it incorporates many of the traditional legends of the town including the Barguest (the supernatural fierce black dog, which is a Yorkshire legend), the white lady alleged to haunt the Abbey, myths surrounding St Hilda, and some of the Dracula myths too (the witch crawling down the cliff is very redolent of this); but what I loved most about this book is the way it captures the quintessential essence of Whitby as a magical town. The children arrive on the train - and in all honesty there is no better way to arrive in Whitby. The train service might be rubbish and expensive nationally these days, but there's something magical about the point where the train stops and then goes back on itself in order to get to Whitby. It literally is like going back in time. The children in the story arrive and are swept away by the magic of the town - staying in one of the famous yards of the town with "Aunt Alice", they visit all of the best places in town (Pannet Park and the Museum there, with its corpse candle and model of the Abbey before the central tower collapsed - do not miss this if you go to Whitby) before becoming embroiled in an adventure with the fisher folk. What this lovely novel also captures is the close-knittedness (if that's even a word) of the town - the gossipy old ladies who spend all their time having afternoon tea and wondering about their neighbours is probably quite true to life - certainly it was an aspect of the town life which Elizabeth Gaskell honed in on for her Sylvia's Lovers (similarly set in the town). Fantastic, we enjoyed every single page! I came across The Whitby Witches whilst looking for a new book to share with my children aged eleven and twelve. I cannot tell you how much we all enjoyed reading this book together. We visited Whitby last year and they loved the fact that they could spot the places we had visited during our stay. Anyone who has been to Whitby will tell you that there is something magical about this little seaside town and Robin Jarvis has been able to capture a little bit Fantastic, we enjoyed every single page! I came across The Whitby Witches whilst looking for a new book to share with my children aged eleven and twelve. I cannot tell you how much we all enjoyed reading this book together. We visited Whitby last year and they loved the fact that they could spot the places we had visited during our stay. Anyone who has been to Whitby will tell you that there is something magical about this little seaside town and Robin Jarvis has been able to capture a little bit of that magic between these pages. The story is an absolute delight the kids were gripped immediately and begged for a few more pages every night. I love being able to share my love of reading with my family and I have read to them since they were small, even hubby comes in to have a listen. The characters in this story allowed me to provide them with a full theatrical performance, during the scary bits you could have heard a pin drop in our bedroom. If you are looking for a bedtime read to share with older kids then this is it, they were washed an PJs on by 8pm each night waiting for their story. Robin Jarvis (born May 8, 1963) is a British children's novelist, who writes fantasy novels, often about anthropomorphic rodents and small mammals – especially mice – and Tudor times. A lot of his works are based in London, in and around Deptford and Greenwich where he used to live, or in Whitby. His first novel – The Dark Portal, featuring the popular Deptford Mice – was the runner up for the Smar Robin Jarvis (born May 8, 1963) is a British children's novelist, who writes fantasy novels, often about anthropomorphic rodents and small mammals – especially mice – and Tudor times. A lot of his works are based in London, in and around Deptford and Greenwich where he used to live, or in Whitby. His first novel – The Dark Portal, featuring the popular Deptford Mice – was the runner up for the Smarties book prize in 1989.